iVOS 5 will support all County-administered risk management programs and multiple lines of insurance; the claims-system centralization and RMIS implementation is among the largest such projects ever undertaken for a municipality. LOS ANGELES—December 1, 2017—Ventiv Technology, the world’s largest global, independent provider of risk, insurance, and EH&S software, announced today that the County of Los Angeles has selected Ventiv Technology’s iVOS 5 risk management system for claims and legal-matter management for the County of Los Angeles. 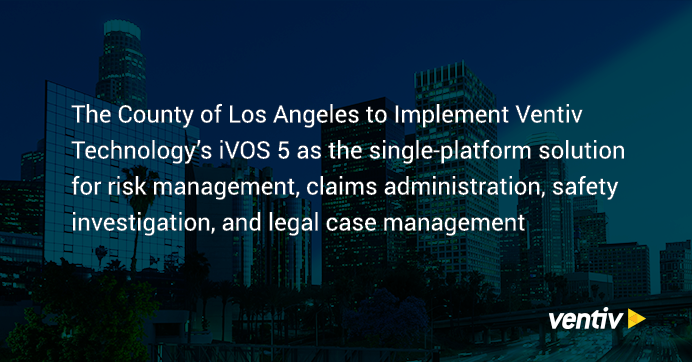 iVOS 5 will be the single, integrated technology system for the online administration and management of all risk management and claims administration programs in Los Angeles County, including leave management, safety investigation and litigation management. iVOS 5 will have more than 2,000 system users across the County when fully implemented. Various self-insurance and commercial insurance programs. The mission of the Chief Executive Office (CEO) Risk Management Branch is to evaluate significant Countywide risks, hazards, and exposures; develop and implement risk management methodologies to fund, minimize, or eliminate loss; and advise the Board of Supervisors and Departments of risk control strategies to mitigate losses. CEO Risk Management administers Privacy, Workers’ Compensation, Liability and Loss Control programs for over 100,000 public service employees. Utilizing data analytics and business intelligence tools, programs are designed to identify County exposures and minimize losses, to ensure the health, safety, and well-being of County employees, minimize risk and fraud, as well as, provide programs for the administration of commercial and self-insurance.